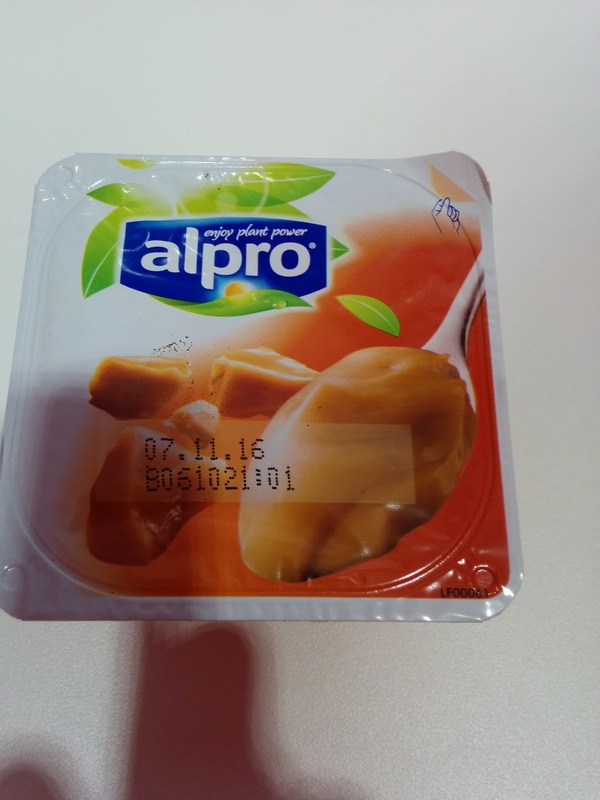 Alpro is a Belgian company that produces alternative dairy products, distributed throughout Europe. I discovered them in Germany, while visiting my Munich office, where our microkitchens were stocked with Alpro products. At the time, I had no idea the products were not dairy based. They make a variety of milks (soy, almond, cashew, hazelnut, coconut, rice, oat, and blends), all in a number of flavors, plus yogurts and a cream alternative, and ... desserts! You can guess which items I was drawn to, not even knowing what they were. The dessert line consists of 4 puddings, ice cream, and a custard, all soy based. The pudding flavors are vanilla, chocolate, dark chocolate, and caramel, except with far better names, like "Heavenly Velvet Vanilla", "Silky Smooth Chocolate", "Devilishly Dark Chocolate", and "Sweet Creamy Caramel" (these are the UK names, the product names I saw in Munich were in, well, German). Softer Karamell (Sweet Creamy Caramel). From the picture on the packaging, I really wasn't entirely sure what the product was. I guessed yogurt, but hoped it was pudding. I guessed caramel flavored. 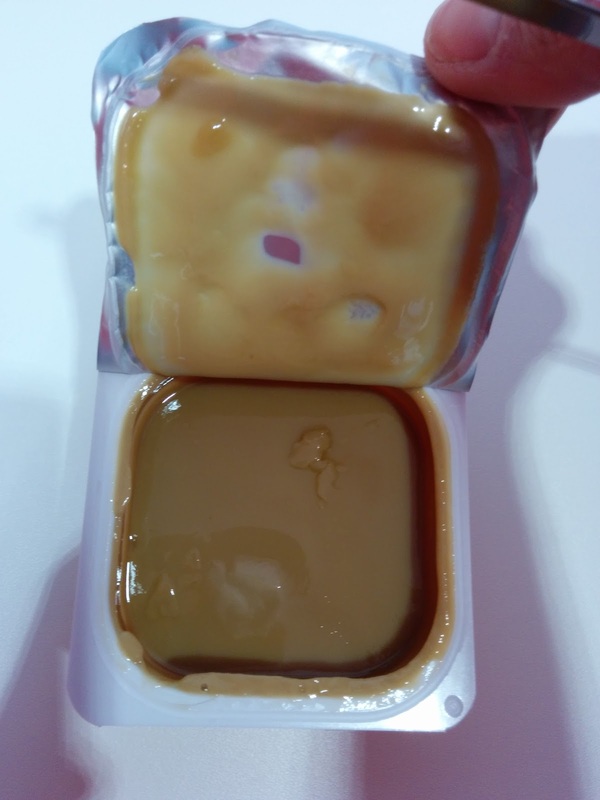 Softer Karamell (Sweet Creamy Caramel): Inside! "Alpro caramel dessert is a delightful treat for your taste buds. Made with only the finest ingredients, this delicious, plant-based dessert makes any occasion special. Indulge in the sweet taste of caramel, with none of the regret!" I know now that it is soy pudding, fairly healthy soy pudding at that. But ... it was so good, I really wouldn't have guessed this. It was creamy. The caramel flavor was more like butterscotch. I loved it. The soy undertone just added to the flavor, rather than tasting artificial. If you topped it with some whipped cream, or a crumble of some sort, it would be a top notch dessert. Even without, it was good, and perhaps even a decently healthy treat. Dunkle Schokolade Feinherb (Devilishly Dark Chocolate) Dessert. "Small, dark and devilishly delicious, Alpro dark chocolate dessert combines silky plant-based creaminess with the seductive powers of real, dark chocolate to tempt you. This wholesome indulgence is the perfect treat." Next I tried the super dark chocolate It was also quite good. 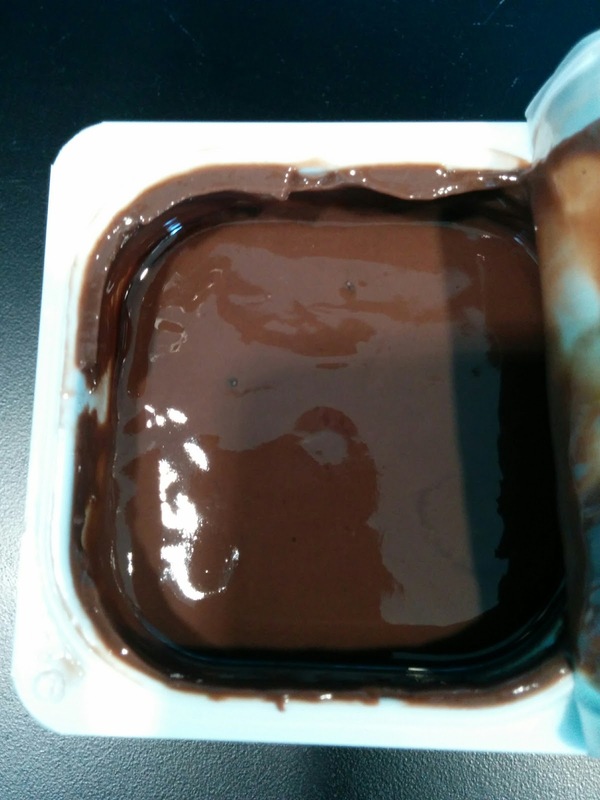 Thick, very rich, dark chocolate pudding. Honestly, I would not know it was soy based. The flavor was good, the consistency was good. No plastic-y packaged pudding here. The Alpro website suggests topping it with cookie crumbles or nuts, or enjoying as is right from the tub, which is how I did it, but I do agree with their suggestions. Really excellent, although I preferred the caramel. On my recent trip to Munich, I walked by Burger King one day, just out of curiosity. I always love to see what different items Burger King, McDonald's, and the like have in other countries. It has become a bit of a tradition for me to visit a fast food place while traveling, just to try out something new. Sometimes, you find real gems, like the Croque McDo in France! I was tempted by items at both Burger King and McDonalds, like the chocolate McToast for breakfast at McDonalds or the Whoppers on red or black buns at Burger King, but, I never wound up with the opportunity to visit until my last night in Munich. I went out to a big dinner, a huge, heavy dinner at Zum Dürnbräu. We ordered dessert, 3 different desserts in fact. The dessert was good. We didn't need more. As we left the restaurant, the group split into several smaller groups, some going off to a tiki bar, others to another bar, and others to walk back to hotels. I mentioned that Burger King had waffles to the hotel group, and, somehow, the next thing I knew, a group of 4 was going to accompany me to the Burger King en route. This was particularly amusing given that we'd just finished dinner, but, with 4 of us, we knew we could try "just a bite" of the waffle, and leave the country with our (ok, my) curiosity satisfied. Let's just say ... it was a success. Honestly. The waffle far exceeded my expectations. 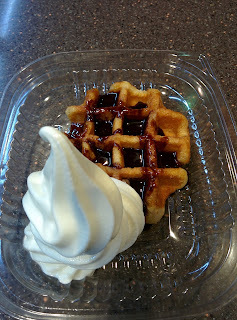 Moments after ordering, my precious waffle was handed over in a plastic tray. I was shocked by several things. First, how quickly it arrived. I know this is fast food, and that is the point, but, how did they get it ready so fast? It was seriously less than a minute after I ordered that my waffle showed up in the window, and then other worker grabbed it, added my toppings, and handed it to me within a few more seconds. The other shock is that it was quite warm. Now, my very limited German did lead me to believe that my "Warme Belgische Waffel" was going to be, er, warm, but, I was still surprised by how warm it was. Anyway. With my warm waffle in hand, I quickly brought it over to my table of awaiting diners. The first took the plastic fork and tried to cut a chunk off just with the fork. He broke the tines of fork in half. 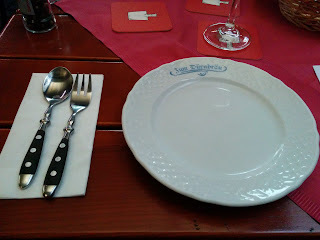 We had only one fork, because I had no idea how to ask for more in German. Now, we had half a fork, and a knife, less than ideal. He still managed to get a small bite cut off, added a little ice cream, and dug in. He seemed pleasantly surprised, declaring that it was "Just like Cinnabon!" (Side note: he loves Cinnabon). I was slightly confused because I didn't think the waffle was going to be cinnamon flavored, and someone else pressed him on this. He then told us that no, it wasn't that it was cinnamon flavored, it was just ... like Cinnabon. I had no idea what he meant exactly. The next person dug in, using the plastic knife to cut off a chunk. This worked much better. He also seemed pleasantly surprised as he took the bite. Finally, patiently, I got my turn (yes, they all dared go before me!) I guess my facial expressions totally gave away how I felt about it. Well, huh. It was ... really good. The chocolate sauce was just standard thin chocolate syrup that they use for sundaes, and I think I was supposed to have the option of caramel or chocolate, but, I missed that part. I wasn't really a fan of the watery chocolate sauce. The ice cream was vanilla soft serve, standard fast food style, which is to say, pretty darn good. Say what you want, but, fast food chains tend to make pretty decent vanilla soft serve. Overall, really quite good, I'd totally have another, and I'm so glad we tried it. Zum Dürnbräu is an institution in Munich. It has been in operation since 1487! Yes, 1487, that is NOT a typo. Currently, the site has a biergarten out front and a second one out back, and a restaurant inside. At one point they were also a brewery, so of course beer is still a focus of the establishment. 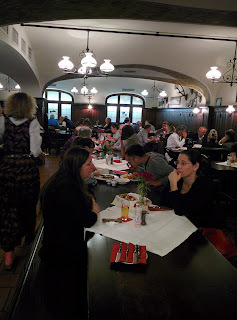 The menu is traditional Bavarian cuisine, as you may expect given the history. 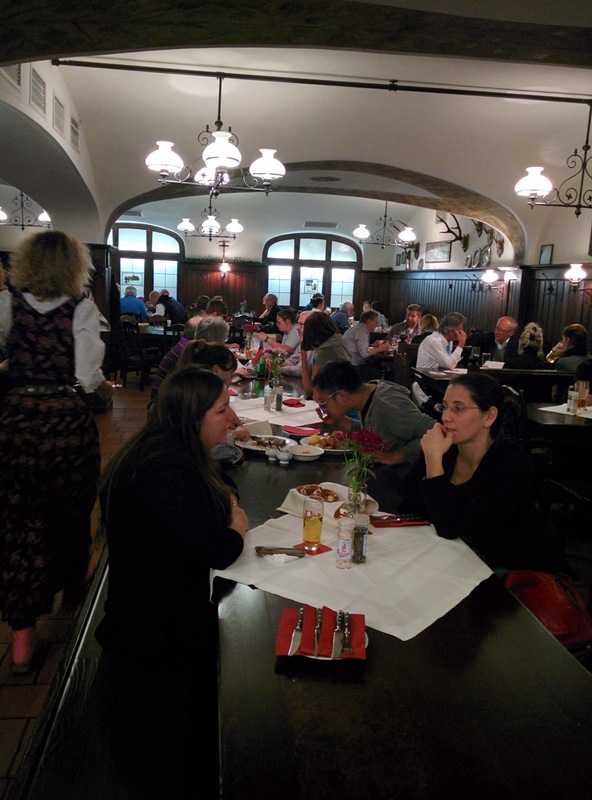 It is also the only place that I dined while in Munich that I selected, as I was there for a conference, and thus, large group conference dining it was. I did my usual Julie-research before my visit, and was pretty stumped about where to dine. I can't say that Munich is known for its food (there are a few Michelin star restaurants actually, but, they are quite pricey and not appropriate for a business trip). Everything else sounded highly mediocre, the only rave reviews were for Mediterranean cuisine, which is never my choice, or, beer and pretzels, like Augustiner Keller, where our groups ended up most nights. 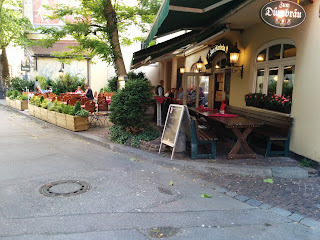 After extensive research, I found Zum Dürnbräu. It actually gets good reviews, and, even locals claim the food is good (AND the dessert, always a key element for me). So, when I was able to plan a dinner for a small group of 4, it is Zum Dürnbräu we headed. I easily made a reservation online, and got a confirmation e-mail, but, then the table wasn't reserved when we arrived. It wasn't a problem, as we were dining a bit early, but, if we had requested a later time, it certainly would have been a problem. The place filled up fast. The food was shockingly delicious, both the savory and the desserts. It was however very heavy food, in ridiculous portion sizes, so you really, really should split mains with others (which we didn't do). Not a single one in my group was able to finish our individual mains. The food waste distressed me, but, there was soooo much extra, that it wasn't possible to just "have a few more bites to finish it", which is normally what I end up doing. 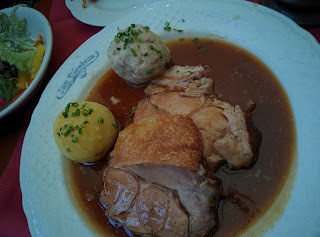 Anyway, I really liked the food, unlike pretty much everywhere else I dined in Munich. So, two days later, after a two day conference of nearly 200 people, I decided to return, this time with a much larger group: 25! I very rarely "waste" a limited opportunity exploring a new city to return to the same place twice, but, Zum Dürnbräu was such a solid choice, not that I had any evidence of competition, that I really did want to return. I'm glad I did, uh, glad I dragged 24 of my closest dining buddies? We had our one German speaking colleague call in the morning to make the biggest reservation he could. He secured us a large table in the back garden for 20. I let others know of our plan, and quickly we filled the 20 seats. But word of mouth was strong, and somehow an additional 5 people found their way to the restaurant with us. The restaurant didn't seem to mind that we kept adding people in, as we crammed them into our table, pulled up extra chairs, and just mushed in. Everyone seemed to want a chance to dine with the "famous" Julie Dining Club! Visit #2 was also a success, and most everyone agreed it was the best food they had in Munich. Service was good on both visits. We were provided with English menus, and our server the first time was relatively comfortable speaking English. Our server the second night didn't speak any English to us, but, it was easy enough to communicate, and, we did have one German speaker with us who could explain some things, like, that we wanted to dine family0style this time, having learned our lesson with the individual orders the first time. I'm glad I went twice, and honestly, I would have gone back another time if the opportunity presented itself. It is the only place, besides perhaps Burger King (more on that soon! ), that I'd return in Munich. Finding Zum Dürnbräu might be a bit difficult if you don't know what to expect. 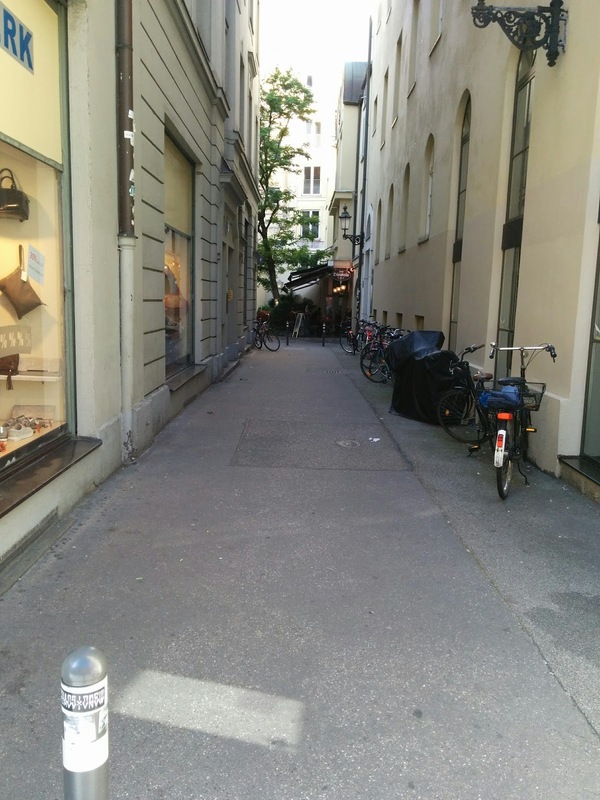 It is located close to the Marienplatz, a very lively, jam packed, shopping district. But, the storefront does not open into the mall area directly. 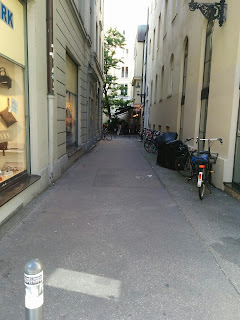 Instead, you go down a side alley, lined with bicycles and little else. At the end of the alley, there it is, a bit of an oasis. Nice curb appeal, with a cheery front biergarden. I think they don't take reservations for this front area, and it isn't very well protected from the rain, a common problem we faced on this trip. The main restaurant inside features one long, communal table, plus tables of assorted sizes. Decor is what seemed to be "traditional Bavarian", like the cuisine. On both visits, every table inside had a reserved sign on it. Like I said, make reservations here. The back biergarden is where we were seated both times, helpfully protected by awnings. Most tables back here were also reserved. Along the fence was a trellis with ivy, and a fair amount of vegetation. It really did create a nice relaxed garden sense. The back garden had no view to street, so it was a nice oasis, although, a beer-filled oasis. 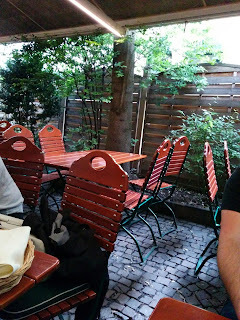 The ground was cobblestones, the tables and chairs wooden with red slats. The red theme continued to the tablecloth, napkins, even the coasters. Each table had a candle on it. The drink menu was 3 pages long, and was entirely in German, so, I didn't quite know what was available. It seemed to be that there was beer on tap or in bottles, apertifs, red wine, white wine, a rose, and I think a full bar. There also seemed to be standard soft drinks and juices. My colleagues got beer (non-alcoholic was available too), but, I don't like beer. I didn't really want wine at a beirgarden, so I thought cider might be a good choice, and would pair with the food in the same way that beer would. 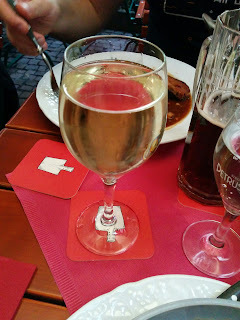 I tried to ask my German speaking fellow diners if cider was a thing in Germany, but, they didn't think it was and we couldn't identify any on the menu. I found one section of the drink menu that I didn't understand. Weinschorle, it said. I asked what that was. My colleagues said it was like wine mixed with sparkling water and maybe some fruit. I figured that at least sounded different, so, I went for it. It turns out, weinschorle is a wine spritzer. I went for the Weiß, the white version, not entirely intentionally, the first time. I was given a very full pour, even though I ordered the small size. Ah, German portions. At least it wasn't a stein-full! It was actually pretty much perfect. It did remind me a bit of cider due to the carbonation. It was refreshing, crisp, and went with the food just like a beer would. I was happy with my choice. On my second visit, since I liked the weinschorle before, I opted for the red version. I didn't like it. The cabonation level was fairly flat, and the red wine used wasn't very good. So, barely sparkling low quality red wine? Yeah, not good. 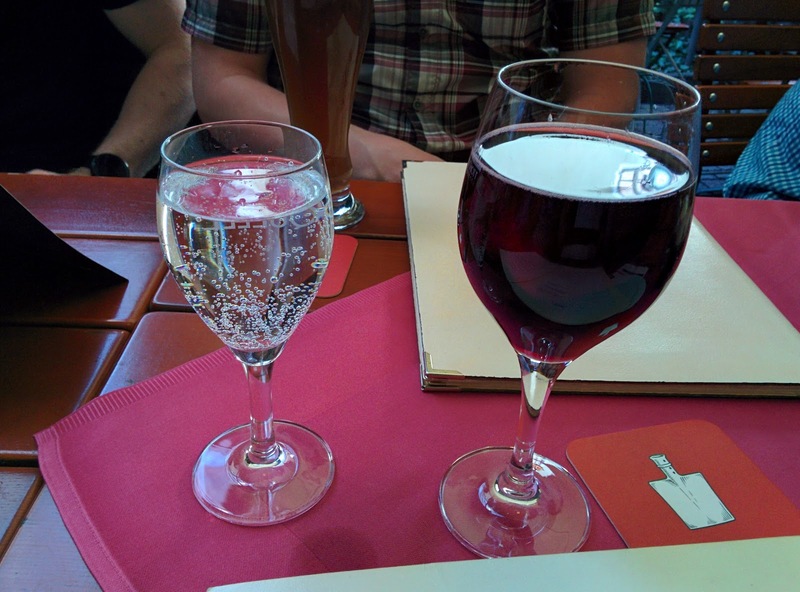 I also opted for sparkling water on both visits, served with a cute wine-shaped glass. I did notice that at most places in Munich, sparkling water always came with custom glasses, much like the different beers. As I mentioned, Zum Dürnbräu has been around since the 1400s. As you can imagine, this means that the food is pretty traditional, lots of meat, lots of potatoes, super heavy stuff. Everything we had was cooked to perfection. Execution really was flawless, which is saying something for group dining. Everything was incredibly well seasoned. 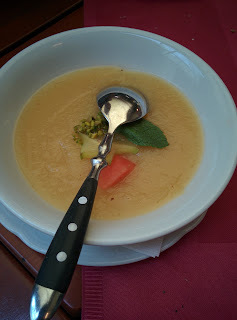 Shockingly, it was the fresh vegetables, mostly in side dishes, that impressed me the most (which, perhaps was my body really wanting something light after a week of heavy eating), but, of course, I did love the cream sauces. I'd gladly return to have some of these dishes again, or to try more items. I'd go with a clear plan to share dishes, and make sure we have at least one salad in the mix to lighten the load. Traditional & Cold Dishes Menu. The menu is many pages long, in a binder. Luckily, they do offer English menus for the food portion. 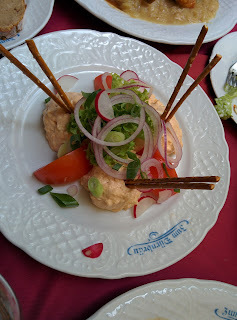 We skipped everything from the first few categories on both visits: soups, salads, and sausages, although I really was interested in the "Salat mit Lachs & Forelle", a salad with smoked salmon and trout, with "apple potato paddles" and horseradish dressing. Alas, I never got around to ordering it, and, didn't go back a third time. Next time, seriously, I want that salad. I would also love to order the Bayrischer Leberkäs, Bavarian meatloaf, listed in the sausages section. My hotel had it at breakfast and I kinda adored it, and would love to try another version, and, ideally, not at breakfast. On our first visit, once we sat, a basket of two pretzels was brought out (for our group of 4). On our second visit, we were not provided any pretzels, even though every other table was. I'm not sure why, perhaps they just didn't want to deal with a group our size? Also, why only two pretzels for 4 people on the first visit? Anyway, the pretzels were fine I guess, salted, served cold. They weren't particularly fluffy. Not really my thing, and fairly average. Not worth filling your stomach with, when so many great things lay ahead. Literally my only food item criticism. 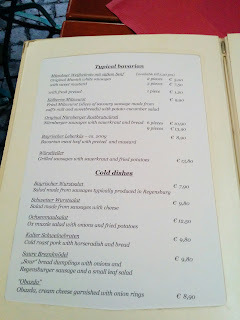 The cold dishes section of the menu has some interesting items like salads made from sausages, cold meat, and even a ox muzzle (!) salad. We skipped all these things the first time, but, on the second visit, I decided to order one cold dish, a dip, as a starter. Or, what I thought would be a starter. Except, it came when all the other food did, which was totally overwhelming, as our table was entirely full. I also ordered it intending it to go with the pretzels, and since those never came, it didn't quite work out correctly. Doh. "Obatzda, cream cheese garnished with onion rings." So, what is Obatzda? Its generally a mix of a soft cheese, like camembert, with butter and sometimes cream cheese. Super healthy stuff. 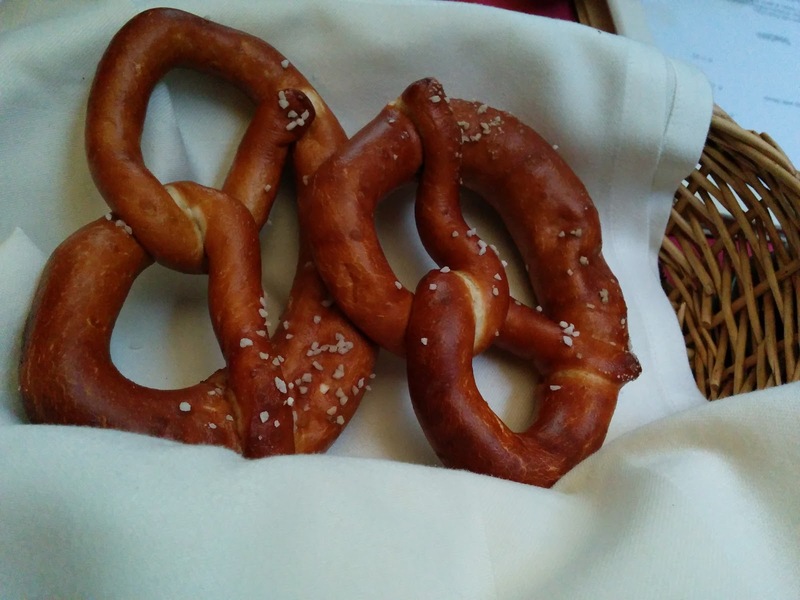 Its used as a spread for pretzels, and is a common beirgarden snack. Or so I hear. Anyway, I love cheeses and dips, so on the second visit, I thought this would be great to nibble on while we waited for the mains, and, I thought it would make the pretzels more interesting. But since it came with the main meal, and we never got any pretzels, my plan was a bit foiled. This dish, when it arrived, looked nothing like I expected. For one, it had crazy thin pretzel rods sticking out of it, like the store bought ones we get in the US. It really did look a bit silly. Second, the "onion rings" turned out to be just that ... rings of raw red onion. I sorta thought it would have fried onion rings, since that is what onion rings are to me, but, on second thought, it was a cold dish, I didn't want cold fried onion rings. Third ... there was basically an entire salad on top, with radishes, tomatoes, and greens, none of which were mentioned on the menu. The vegetable elements were all fresh and really quite good, albeit a bit out of place. I still really enjoyed it, although entirely not what I was planning. The cheese mix was creamy and very flavorful. While I didn't really have anything to slather it on that made sense, I found that even just coating a tomato in it was delicious, and, probably better than filling my already full stomach full of more bread anyway. The harsh red onion also worked, and helped cut the richness. Overall, my second favorite savory bite the second night, and one I'd gladly get again. It might seem strange to order vegetarian food in Germany, given that I'm not vegetarian and German cuisine seems largely meat focused, but, I actually really wanted all three of the vegetarian mains. Of course, being traditional German food, you can be assured that vegetarian did not mean light, and these items were just as heavy, if not heavier, than their meaty counterparts, loaded up with cheese and cream, and plenty of carbs. On our first visit, I opted for a vegetarian main myself, and on the second, I ordered one for the table. 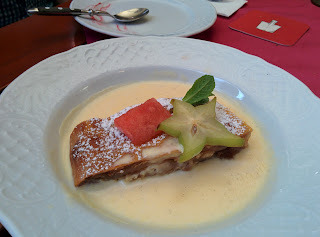 I never got to try the third, the Gemüsestrudel, a savory strudel filled with vegetables and topped with cream sauce, but, if I manage to go back sometime, it is high on my list. 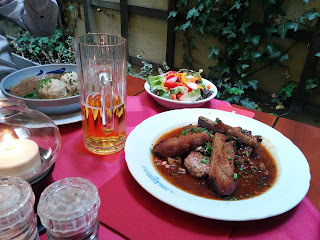 While perhaps not known for vegetarian food, I can safely say that these traditional dishes were fantastic, and, actually the highlights of my meals at Zum Dürnbräu were all vegetarian. 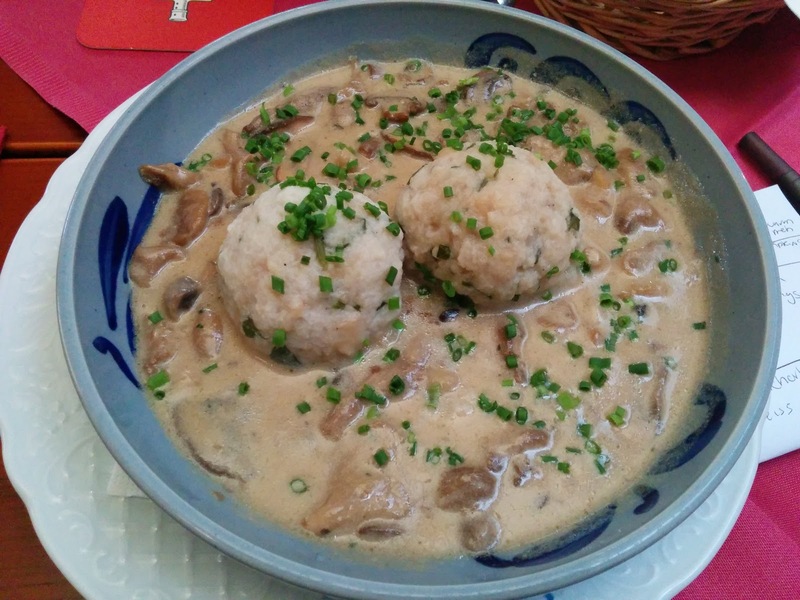 "Fresh mushrooms served in a creamy sauce with herbs and bread dumpling." On my first visit, when no one wanted to share dishes, I picked this as my entree. It basically sounded like all things I love: cream sauce. Mushrooms. Bread dumplings. And ... it was totally delicious. Comfort food at its finest. Two huge bread dumplings, in a super rich cream sauce, with tons of mushrooms. There is no way a single person could finish this dish and still manage to walk out of the restaurant, even without ordering dessert. And I knew I wanted dessert, so, I tried hard not to eat it all. But it was a battle, as it was so good it was really, really hard to stop, even when I was beyond full. So, starting with the dumplings. I wasn't actually entirely sure what a bread dumpling was exactly, but, these were basically big, soft, moist, balls of bread. Like a scoop of bread pudding or stuffing perhaps. They were really well seasoned, and perfect for soaking up all the sauce. I know this description doesn't necessarily sound great, soggy, moist, bread balls, but, I assure you, it worked. And you'd think that I'd want more texture, a sear on the outside, but, nope, they were fine just like this. And that sauce. Swoon. A super rich, super heavy, cream sauce. Like the dumplings, well seasoned. And loaded up with mushrooms, assorted varieties of mostly exotic mushrooms, sliced into various sizes, all well cooked, soft but not mushy. This dish reminded me of stuffing smothered in gravy, or biscuits smothered in gravy, melded with mushroom stroganoff, all comfort foods in my world. Everything about this dish was a winner. Yes, it was rich, it was heavy, and the portion was far too big, but, it was wonderful, my favorite savory dish of all the visits. In the future, I'd love to get this again, along with a salad, and split them both with someone else, and then of course, have dessert. That would be the perfect amount of food and balance of heaviness. "Spätzle 'Allgäuer style' mini dumplings covered with a creamy cheese sauce and roasted onions served with a small side salad". 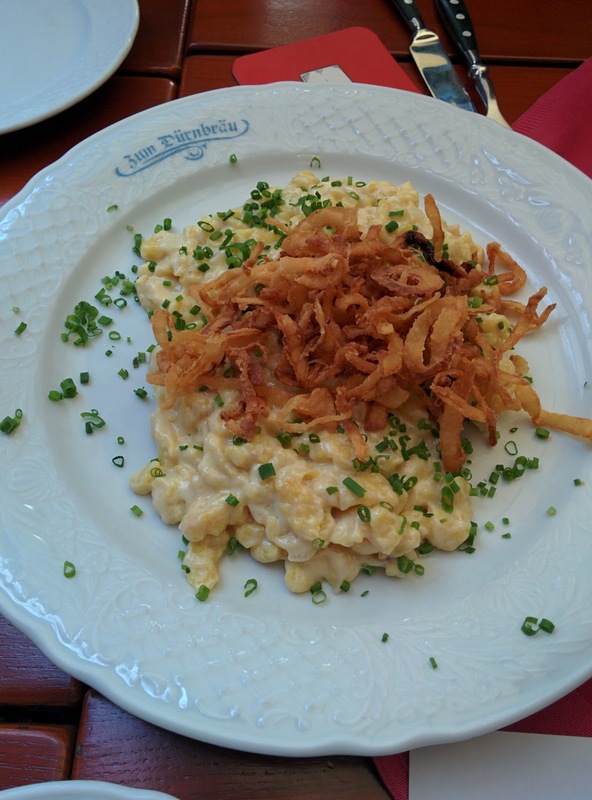 On the second visit, I ordered the spätzle for the group, thinking it would be nice to have something besides meat, and, I wanted to try it myself anyway. This one said it was served with "roasted onions", which turned out to be crispy onion straws. Ok, so, "onion rings" is raw red onion, and "roasted onions" is crispy fried onion strings. Translation is hard. I'm not sure if you can tell the scale of this dish, but, this was a huge plate, and it was loaded up with spätzle. With our group size, it was perfect, as we all got a scoop and it wasn't too much, but, like all the dishes, I can't imagine trying to eat it all myself. The sauce was creamy, it was cheesy, it was pretty awesome, basically like uber mac and cheese. Uber mac and cheese, with a ridiculous pile of crispy onion strings on top that is. Of course I loved the fried onions on top too. Overall, this was my favorite savory dish of the second trip, and my fourth favorite savory bite overall, and I'd gladly get it again. 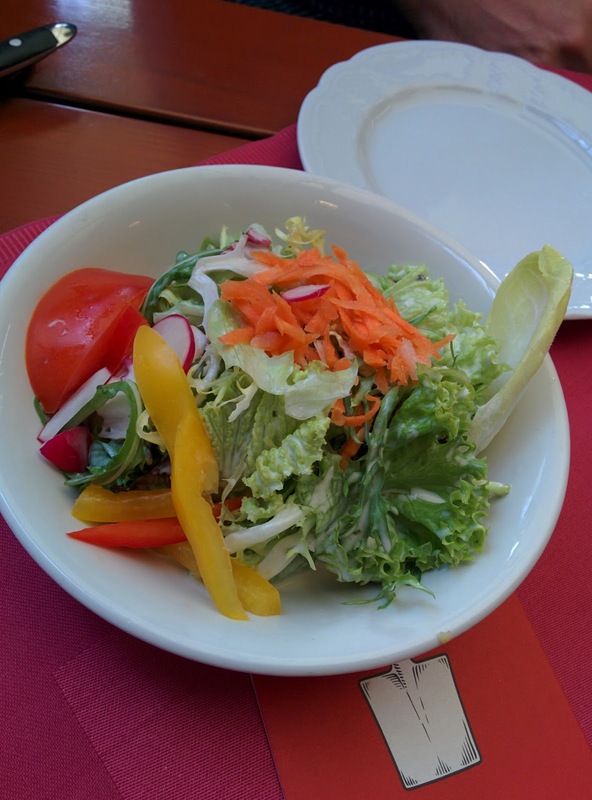 Small Side Salad (with Kässpätzle). The spätzle was served with a salad on the side, presumably to cut the richness of the dish. It was a shockingly good salad, just like the salad on top of the obatzda. I had read reviews where everyone said the salads were great, but, I still didn't quite believe it. Why on earth does this place make a good salad? I have no idea, but, it was super fresh, and full of quality ingredients like bell peppers of assorted colors, carrots, radishes, and tomatoes. It was wonderfully seasoned, and had a really delicious, creamy dressing. I actually liked the salad even more than the spätzle itself, making this my third favorite savory bite. The salad is served as a side dish a la carte as well, and I'd recommend it, just to have something light. We focused mostly on the specials, because, well, they are special? The theme here was huge portions of meat, in well seasoned, tasty sauces, with complimentary vegetable side dishes. "'Dürnbräu stories', medallions of pork served with hearty cooked sauce of bacon, onions, herbs, garlic and fresh mushrooms, topped with stripes of roasted dark bread and a small side salad." 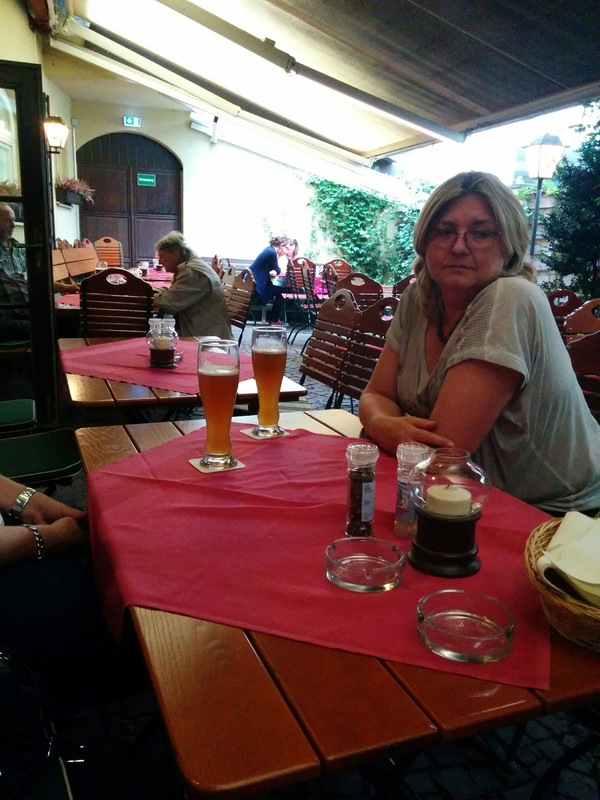 On my first visit, two of my tablemates each got the Dürnbräu Geschichten. It too was a crazy hearty portion, and served with the same excellent salad on the side. I didn't try the pork, nor the bread, as I mentioned, this wasn't a sharing group, but, I did want to try the sauce, so, when one diner was trying to identify the ingredients in the sauce, I volunteered to uh, help. The sauce was very complex, and my guess was veal based, but I really don't know. Serious depth of flavor though, and, I loved the bits of bacon in it. If I wasn't already busy lapping up my own sauce, I would have liked even more. "Oven fresh pork roast served with crackle on dark beer gravy with potato and bread dumpling and white cabbage salad." This was a hearty portion of meat, served with two balls on the side. The first ball was one of the same bread dumplings as I enjoyed on my first visit (although it seemed smaller here), and was not covered in the delicious cream sauce. It was fine for soaking up this gravy, but, was much better in my creamy mushroom sauce. The other ball was a potato dumpling, again, not quite what I was expecting. Does dumpling just mean ball? The potato dumpling was entirely uninteresting to me. Basically just a scoop of compressed potato. In the world of potato based items, this was about as boring to me as boiled or baked potatoes. Why not a nice pile of mash at least? The pork roast I guess was fine, but, I don't really like roast pork, and I didn't love the beer gravy either. My least favorite of the dishes, but I think this was due to personal preference. I wouldn't want this again, but, the others seemed to think it was fine. The crackle was good. White Cabbage Salad (with Schweinebraten). The pork roast was served with a white cabbage salad on the side, a very generous bowl full. It was topped with green onion, radish chunks, and bacon bits. It was really quite good. The cabbage was fresh and crisp, and it had some horseradish mixed in for some kick. The bacon bits added a crunch and saltiness. I loved this, as silly as it sounds, this side dish was my favorite savory of the night. See, I don't always go for the heavy, decadent stuff! 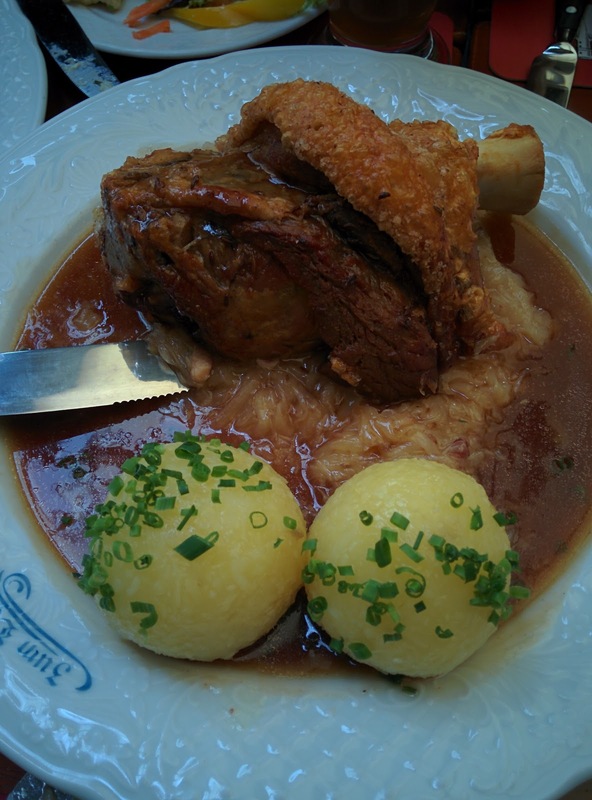 "Half crispy knuckle of pork, directly out of the oven served with sauerkraut and potato dumplings." This dish was served with two of the potato dumplings. I'm not sure how they choose what dumplings to serve with what, as it seemed just as appropriate to me to have one of the bread ones here too. Anyway, I still wasn't into the potato balls with this dish, although they were good to soak up sauce. 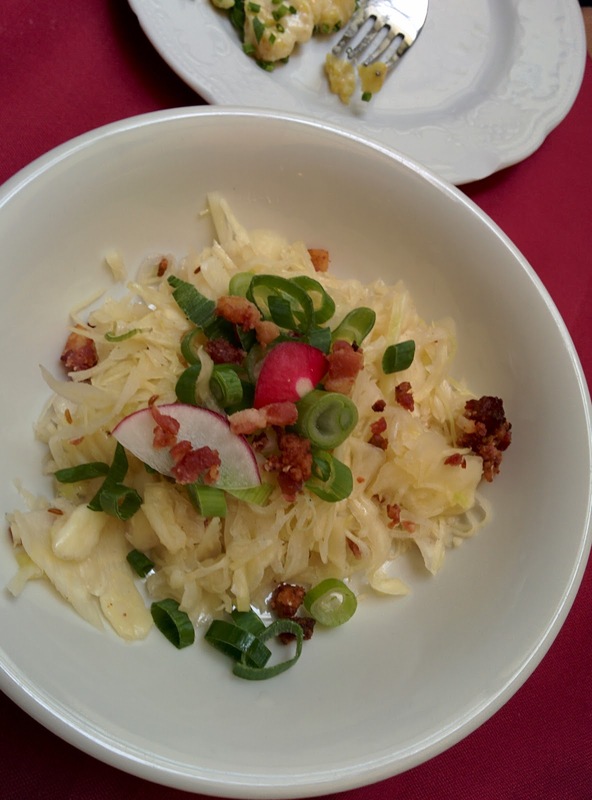 The sauerkraut in this dish was actually in the base of the dish, and it was warm and creamy. I'm not sure what else was in there. And, the main attraction, the pork knuckle (or ham hock as I know it). They nailed the cooking on this, somehow making it tender and shred easily with a fork. It must have been braised or roasted for a very long time. The "half crispy" portion was totally crazy, I'm still not sure how that was done. Was it the skin? Was it dunked in something and deep fried? I have no idea, but it was crazy crispy, salty, and right up my alley. While this dish isn't one I would have wanted on my own, I was glad to try it and really enjoyed the kraut and crispy bits more than I expected. "'Wiener Schnitzel' veal escalope, covered with bread crumbles, pan fried in butter, served with roasted potatoes and cranberry jam." Because I knew it would be a crowd pleaser, I had to order Wiener Schnitzel for the group. It was served over roasted potatoes with a little bowl of cranberry jam on the side. 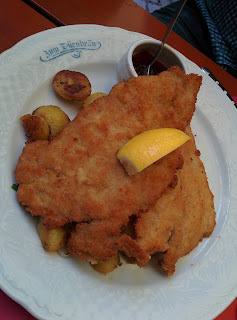 The schnitzel was good, pounded thin, very crunchy coating. The potatoes were fine, but, just roasted potatoes. This was all fine, well executed, but not particularly novel or special to me, so, after a couple bites, I left this for the others to polish off, while I focused on the things I liked more. Of course, one critical reason I pick any restaurant is the dessert. 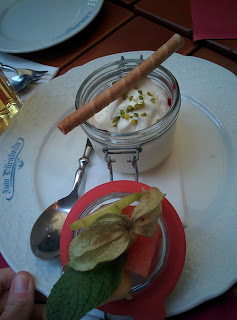 Zum Dürnbräu is actually known to have great dessert options, all home made. The dessert menu has only 5 items on it. The classic desserts: apple strudel and bavarian cream, plus a interesting sounding "pancake filled with ice cream", and two versions of kaiserschmarrn. 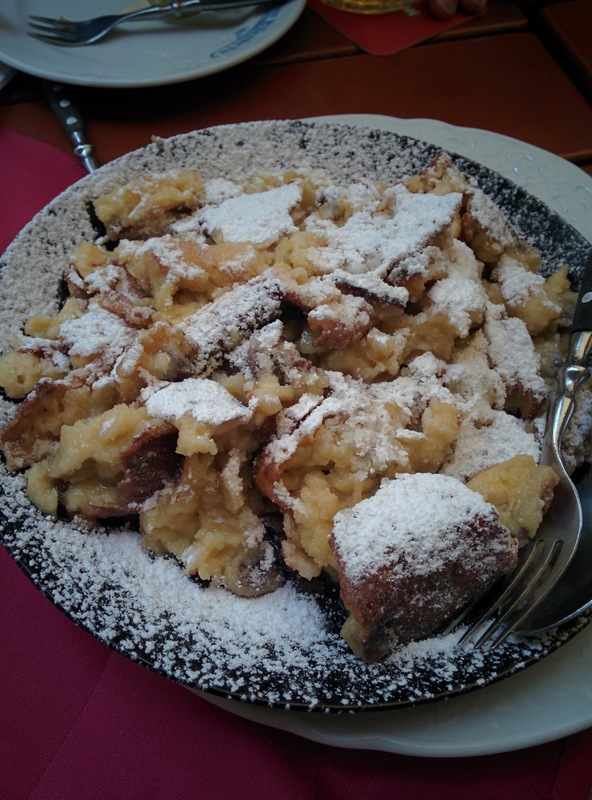 What is kaiserschmarrn? Well, the menu said "Warm specialty, directly out of oven, big special pancake, dough, added with almonds and raisins served in twitched bits in a pan, with stewed apples." I of course had done my research, and knew that these were the thing to get. The description sounds a bit strange, as in, what is a "twitched bit", but, what it is is a giant, and I mean giant, shredded pancake, sorta pan fried. Reviewers go nuts over these things, both versions, and report that they can easily serve 4 people each. I doubted that, but, it turns out, they were right. Since I returned with a large group on the second night, we were able to try nearly all the desserts. Before dessert was served, we were provided fresh plates and cutlery. I appreciated that they brought us dessert plates, many places don't provide plates for dessert, even when you are sharing. "Bavarian version of “Kaiserschmarrn” directly out of oven served in twitched bits in a pan, with stewed plums." 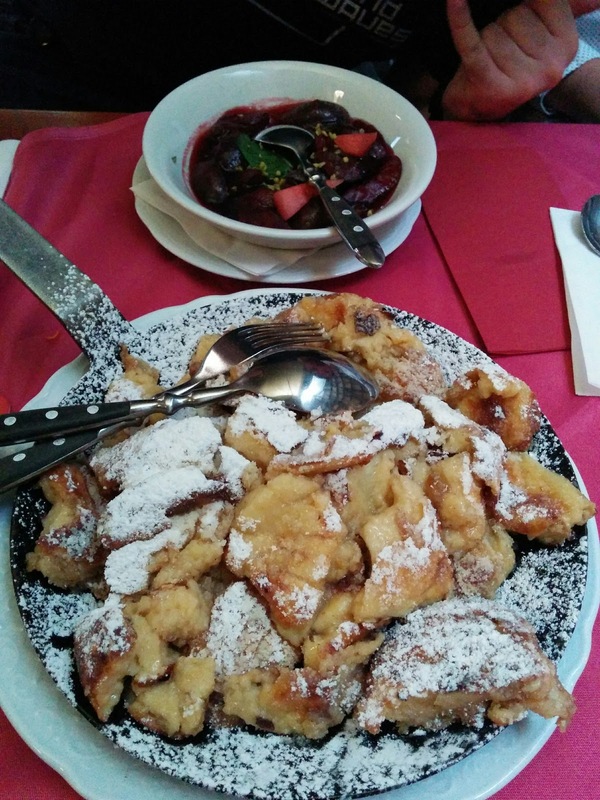 On my first visit, since we had only four people, and, we were all stuffed since we didn't share entrees, we needed to get just one item, and picked the semmelschmarrn, the Bavarian version of kaiserschmarrn. From what I could tell, the main difference between the two is that it came with stewed plums on the side, rather than stewed apples. I like plums in general far more than apples, and most reviewers had agreed this was the better dish, so, Bavarian style we went. I knew that this was going to be large, and I knew that reviews said it could feed 4-6 people, but, I also know that I can eat a lot of dessert (although, I'll admit, after such a huge, rich meal, I didn't actually feel like I *needed* dessert, a pretty rare thing for me). The rest of my group was similarly full, but, I had read so many good things about this dessert, that I had to order it. My eyes went a bit wide when the giant cast iron pan was placed in front of us, loaded up with semmelschmarrn. The "pancake" was basically chunks of sweet, hot dough. The chunks came in assorted sizes, were crispy on the outside, and moist on the inside. While not technically fried (I think they are pan seared in lots of butter), it basically reminded me of fried dough, except, sorta caramelized fried dough. The entire thing was coated in powdered sugar, amping up the sweetness even further. This was truly delicious. I'd compare it more to fried dough or even beignets than pancake, except that you got your pick of assorted sizes, and thus textures. In the mood for a crunchy bit? Go for a smaller, thinner chunk. Want doughy deliciousness? Pick a big one. It was tasty and fun to eat. Why don't we have this in the US? Turns out, "twitched bits" are delicious! On the side was the stewed plums. The fruit was very tart, and none of us liked it. One bite in, I realized there was also a few chunks of watermelon (!) on top of the plums, and wisely didn't even try a second bite. The pancake was delicious enough on its own that we didn't feel like we missed out, but, we all commented that it would be even better with whipped cream. Anyway, this was very, very good, and I'd gladly get it again. The portion is huge, and needs to be shared for sure, ideally with at least 4 people, and ideally not after a huge, heavy meal. Heck, go just for beer and dessert, I'm sure that is fine. "'Austrian style' Warm specialty, directly out of oven, big special pancake, dough, added with almonds and raisins served in twitched bits in a pan, with stewed apples." 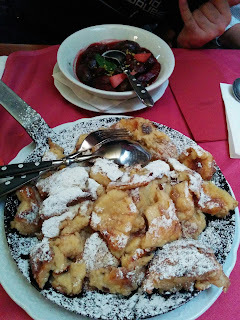 On the second visit, I decided we should try the kaiserschmarrn, for variety, and because I didn't like the plums themsevles anyway. The pancake was nearly the same, except this one also had chunks of almonds and raisins mixed into the dough, which I liked more. They added a bit more texture, a bit more flavor. I think you could really mix in anything that you'd put in bread pudding, really. But, otherwise, the pancake was basically the same ... delicious. The "stewed apples" was applesauce, and, like the plums, it came garnished with a chunk of watermelon (and starfruit, mint, and pistachios). Seriously, why so much watermelon? I didn't like this as a side either. I'm not sure which I liked better, this or the plums, as I didn't want either of them. No one else did either, and after one bite, no one went back for more. 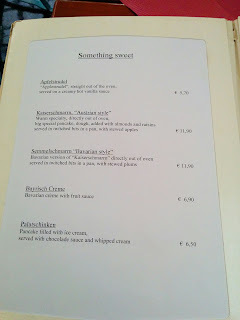 "Bavarian crème with fruit sauce." The previous day, at Augustiner Keller, our gluten-free diner ordered the Bavarian Creme. I didn't try it there, but, it inspired me. I've only ever had Bavarian Creme as a filling for donuts, but I love custards and puddings, so, this sounded like the perfect thing to try, and, traditional for the region too. The Bavarian cream was ok, not quite the consistency I was expecting, a thick, fluffy mousse more than a smooth pudding. It also had a layer of fruit jam and whipped cream on top, and a little sprinkle of pistachio. Oh, and a crunchy wafer cookie on top. I loved that it was served in a little jar, a rustic and cute presentation. But what I didn't love was the contents of the jar lid. Fruit. But not just any fruit: watermelon, my deathly allergy. Again. There was also a gooseberry, a slice of starfruit, a chunk of pineapple, a strawberry, and a mint leaf, but, I couldn't get past the watermelon and didn't try any of the fruit. "'Applestrudel', straight out of the oven, served on a creamy hot vanilla sauce." And finally, the classic apple strudel. And, yup, it too was garnished with starfruit, mint, and deathmelon. Sigh. It was served warm, with warm custard surrounding it. The custard was not as thick as the custard at Augustiner Keller, nor as flavorful, so, on this dimension only, Augustiner Keller provided a better product. I went to try a bite of the strudel itself, on the edge farthest from the deathmelon, before anyone else broke into the dish and contaminated it. One of my fellow dinners stopped me though, saying, "Really? It is not worth it." I realized he was right, and I was being totally foolish. So, I didn't try the strudel itself, although it did seem like it had a good crunchy crust, and, it was warm. The custard though, not great, and I wasn't even tempted to take a second spoonful. By now, you surely know about my not-so-secret love of Rubio's, a fast casual Mexican chain restaurant that I discovered a few years ago in San Francisco. No, I don't really like Mexican cuisine, and no I don't really like fast casual, but, uh, Rubio's is delicious. I've reviewed basically every single type of taco that they make, and the new enchiladas, and the burritos, plus all the seasonal seafood specials, like the signature langostino lobster, as they come out. 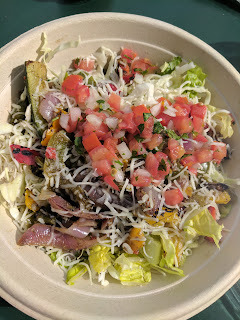 Since I have an entire label devoted to Rubios, I suggest you start there for background, and then return here to read about my new adventures - with the salad. Yes, go ahead and suspend even further disbelief. I'm now telling you I love a fast casual Mexican chain for their ... salad. The vegetarian version no less (inspired by my recent trying of the roasted vegetable grilled gourmet tacos, to great success). Let's start in October 2015. I was speaking at an event in SoCal, the real home of Rubio's. And ... the event was catered by Rubio's! They had a huge spread, including burritos, chips & salsa, and, huge salads. I didn't know it was going to be catered, so I ate beforehand. But, I couldn't pass up the opportunity to get my Rubio's fix! Trying to eat light, I opted to try the salads. Since I had them at an event, there was not an option to add a protein on top, but you can normally top the salads with any of the seafood or chicken options. "A blend of fresh butter and spring lettuce with roasted veggies and light balsamic vinaigrette. Fire-roasted corn, roasted sweet peppers, onions, zucchini and squash, sweet buttery Hass avocado slices, and a cilantro/onion mix on a butter and spring lettuce mix. Drizzled with light balsamic vinaigrette made with extra virgin olive oil. I really liked the salad. The base was just lettuce (spring mix), but it was fresh enough, although not particularly exciting. The veggies on top were shockingly good. Roasted corn, sweet peppers, onions, zucchini, and squash. The veggies were flavorful, fresh, and marinated in something tasty before being roasted. "Chopped salad with salsa fresca and a creamy chipotle dressing. Romaine lettuce and cabbage, a blend of cheeses, tortilla chips, our salsa fresca and mild salsa drizzled with a creamy chipotle dressing." I really liked this salad. The base was just romaine lettuce, again, a bit boring, but it also had crunchy fresh cabbage mixed in. The winning element however was the creamy chipotle dressing. I love creamy dressings, and this was very flavorful, with lots of garlic and just a bit of kick. The salsa fresca was a surprise in a salad, but I liked it more than just regular tomatoes, it reminded me of a marinated tomato mix I used to always add to my Caesar salad at my favorite restaurant in my hometown. The chip bits gave it some crunch, and the cheese helped complete that almost Caesar-like feel to it. So, both successful salads, but I quickly realized that my idea salad was a combination of the two - the chopped salad topped with roasted veggies. And luckily for me, since it was an event with big bowls of each, I could do just that. Chopped Salad with Roasted Vegetables, Takeout. Fast forward to my recent trip to Rubio's. I was really craving vegetables, so a salad seemed in order, and I decided to try to order my custom salad. I ordered the chopped salad, and was immediately asked what topping I'd like, grilled chicken, blackened or grilled salmon, shrimp, etc. I asked for the roasted veggies instead, and told it was no problem. They really do a great job with customization at Rubio's. So, as when I had it at the event, the base was a mix of fresh, crispy, romaine, in just the right bite sized chunks. Mixed in was shredded green cabbage, even crunchier. I was, as before, impressed with the freshness of the lettuce mix. The salsa fresca was again a nicer touch than standard tomatoes, as it had a bit more flavor. Sprinkled on was a mix of shredded cheese, not too much, and it melted slightly from the warm veggies. The veggies were exactly as I remembered from both the roasted veggie salad and the veggie taco I ordered before. Mostly a mix of colorful bell peppers (red, yellow, and green) and red onions, all soft but not mushy, and nicely seasoned (it turns out they marinate the veggies in garlic and lemon first). The veggies had visible grill marks, and an amazing smoky flavor. My salad had a nice sized scoop of veggies, but, I was a bit sad to receive only one spear of zucchini. The veggie mix never includes mushrooms, but I think they would make a wonderful addition as well. The creamy chioptle dressing was again fabulous, it has some serious kick, and, the unhealthy person I am, I do adore creamy dressings. The creamy dressing and shredded cheese in particular go together fabulously. But there was something missing from this salad. The crunch. Which is supposed to come in the form of tortilla strips. They were there when I had the salad at the event, this was clearly just an accidental omission. Overall, I was very satisfied with my salad. It was a huge serving, enough to fill me up for lunch and then have a little side salad for later. I really liked the roasted veggie mix, the dressing, the fresh greens. But, if I were to refine it further ... I'd also add on a scoop of the fire-roasted corn and fresno chiles, that I loved so much in the chimichurri taco. I'd also consider trying the chipotle ranch salad, but it uses a base of spring lettuce, which seems less exciting. Maybe ... chopped salad, plus roasted veggies, plus fire roasted corn, sub chipotle ranch for the chipotle white sauce?